Bogota has gone through a transformation in the last decade or so. A lot better than whats been in the media. Go check it out. Preethi Chandrasekhar of The Eager Traveler, who last wrote last wrote about Medellin, Colombia, Carmel, California, Portugal, Austria, Czech Republic, Anguilla and Dominican Republic, recently went and here are her tips to Bogota should you visit. Bogota is not only the largest city in Colombia, it’s also the capital. I visited this city in August of 2018 and was wowed from the moment I stepped into La Colina Hotel Cottage, a small boutique hotel owned by esteemed Colombian art dealer, Federico Ruiz. More than just a hotel owner, Federico is also an artist and an art tour guide. For a city that once used to regard graffiti art in the same vein as cocaine, I discovered that Bogota has sure come a long way. With Federico as my guide, I was able to gain insight into the city’s transformation and discovered a dynamic city poised on the edge of stardom. I flew from San Francisco into Medellin with a stopover in Panama City for about an hour. I arrived into Medellin in the afternoon and opted for a taxi transfer from the hotel I was staying at. The one-way trip cost me $26. After a few days of exploring Medellin, I flew to Bogota on an approximately one hour flight. A 15 minute, $8 Uber ride later I was at La Colina Hotel Cottage located on top of a hill. The best way to get around Bogota is Uber and if you’re in the old town area, then walking is perfect. Taxis can also be hailed but not every driver speaks English. I pull up in my Uber in front of the gates of La Colina Hotel Cottage, situated at the top of Suba Hill, on a late Thursday night. The high gates swing open to reveal a young-looking, energetic man coming forward to greet us. It is Federico, the legend himself. And he IS somewhat of a legend in Bogota. A renowned art dealer, Federico comes from a family of artists. His father is an artist, his brother a sculptor and Federico himself is an art dealer and collector, dealing with art for the past fifteen years or so. Federico says, “Staying with us is like staying with a family of artists.” He is right. I felt very much like I was living with a family of artists, surrounded by beautiful works of art from his father, brother and other Colombian artists. Federico and his wife opened La Colina Hotel Cottage about five years ago and it is currently ranked the number one hotel on Tripadvisor in Bogota. To understand why, you have to experience a stay for yourself. Entering La Colina through a driveway surrounded by plants, I am utterly charmed by this boutique hotel immediately. A large courtyard separates three small buildings. Federico and his lovely wife have built their home on the top floor of one of the buildings, while the bottom floor houses two guest bedrooms, designed tastefully. Walking through the beautiful courtyard with a traditional clay oven, you enter a separate building that houses three additional guest bedrooms. These bedrooms are large, also with attached bathrooms that feature organic toiletries, which I love. The living, dining and kitchen areas are yours to use while their housekeeper Esther can also whip up meals upon prior request. Her daily breakfasts are incredible, from fresh arepas, to eggs, fruits, granola and fresh juices from exotic, tropical fruits. Federico will often come over from his home to greet you during breakfast and chat about your plans for the day. It’s fun to be able to pick his brain about his thoughts on the art scene in Bogota, and his views on the rapidly evolving city. Federico and his wife also love to cook and if you choose to have dinner at La Colina Hotel Cottage, he and his wife will whip up some traditional meals (perhaps in the clay oven outside) and invite you to dinner with them, along with a good glass of local wine by their lovely fireplace. It is truly like a home away from home, with locals who will happily share their home and culture with you. 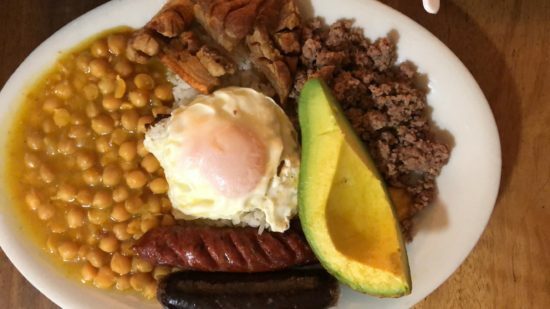 Bandeja Paisa. That is Colombia’s national dish, and consists of rice, beans, ground beef, chorizo, arepas (of course), avocado, plantains, and a fried egg. Phew. That’s a big meal yes but you cannot leave this country without trying this dish. Another staple dish is the Ajiaco. It includes chicken, potato and corn soup along with rice and avocado. Mix this up together in the bowl of soup and you’ll have another hearty meal. I did try a small piece of Chiguiro on the streets of La Candelaria. I later found out it was a “rodent” of some sort. It might have been a beaver but I’m still not sure! Let’s just say I won’t be trying that anytime soon again! Now, the best part of Colombia in general, is the fruits. Colombia is one of the most bio diverse countries in the world primarily because of its location on the Caribbean and the Pacific, as well as the differing altitudes up and down the Andes range. Colombia also has part of the Amazon forest so overall the climate is very tropical with very fertile soil. You can plant pretty much anything and it will grow. I discovered quite a few exotic fruits that I’ve never heard of in America. I had a banana passionfruit, a starfruit (Carambola), the pitaya (which reminds me of a dragfonfruit), Sapote, Mangostino, Noni….and well you get the picture. The list goes on and on. La Puerta Falsa – Try the Bandeja Paisa, Tamales, Chucula y Almojabanas (sweet bread and soft cheese), hot chocolate. Hours 7am-9pm Mon-Sat, 8am-7pm Sun. La Tabula – Try the Braised Beef Shank. Reservations are not hard to come by. Hours 12pm-4pm Mon-Sun, 7pm-11pm Thu-Sat. Andres Carnes – This place is an experiential place, make reservations, come prepared to eat, drink and dance the night away and don’t forget to walk around the many different “areas” in this beautiful restaurant. It’s a wonderful time to visit Bogota as the capital is experiencing a revival of the arts in the midst of a growing middle class and an improving economy. Uncovering Bogota’s art scene starts with Federico Ruiz. Federico conducts art tours for various clientele, ranging from wealthy art collectors to tourists with limited art exposure. His tours really vary in length and time and what you want to see depends on your interests. For example, he might take you to a client’s house to see some of their artwork, or guide you around an art gallery, the spectacular Gold museum, an artist’s studio or take you on a tour of street art. Colombia has a booming art scene. Take graffiti art for example. Graffiti has for the most part held a negative perception in many cultures and Bogota was no exception. This changed however when a young graffiti artist was killed by cops, as he was spraying his signature on a wall. Protests resulted around the city and the mayor then decreed that graffiti will be promoted throughout the city as a form of expression. The Bogota Graffiti Tour estimates that there are more than 8000 street artists in the city. What’s surprising to me is how popular Graffiti is in Bogota. In the past few years, this type of art has gained a certain credibility, having found a voice not only in the streets but also in prominent spaces on tall buildings. 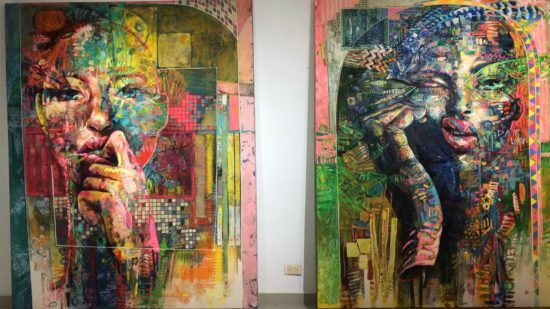 Many of the projects are commissioned by the mayor and city officials, allowing artists to collaborate freely and express themselves without fear of retribution. In fact, in 2014, a well-known graffiti art collaboration, Meeting of Styles, was hosted by Bogota. This collaboration event originated in Germany back in 2002 and is an international collection of graffiti artists who work together for their love of street art. 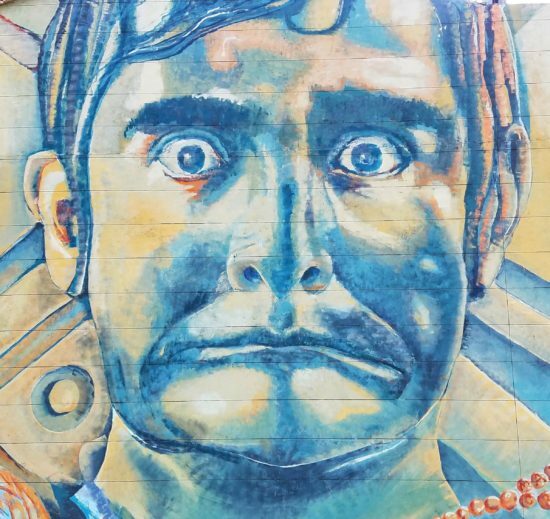 The event in Bogota enabled not only local artists but also artists from Germany, Spain, Argentina who came together to create murals around the city. To see some of these murals, I enlisted the help of Federico who drove us around in his car one beautiful, cloudy afternoon. We first set out to collect a painting from one of his clients who had been evaluating the art piece to see if he wanted to buy it. Walking into his flat, my jaw dropped open at the collection of Botero sculptures and paintings. We also saw many other interesting art pieces and I was quite surprised that there are people in Bogota with such a keen interest in art. I realized then that I had come with a preconceived notion that there couldn’t possibly be such a prominent art scene in a city once known for its dangerous reputation. 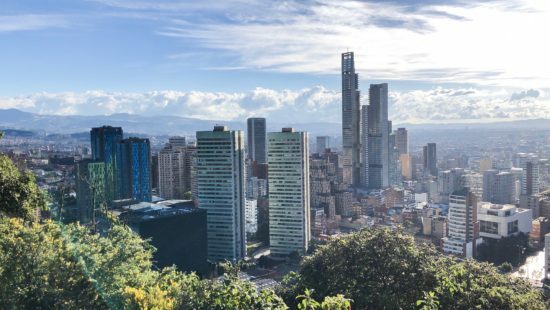 Education once used to have the largest portion of the budget allocated to it but that is now shifting as the government is giving importance to Colombian culture as well. Graffiti is seen as part of this culture and has become a way of social expression. Works of graffiti across the city often depict Colombia’s rich bio diversity (Federico took me to an overpass overlooking a highway – both sides of which depicted land and sea animals), art activism and thought provoking socio-political issues. Federico’s driving tour took us past yet another iconic mural, the Invisible Kiss, on Calle 26, a street in downtown Bogota. A busy street, you can see several works of art here. This used to be an area in Bogota that was very dangerous and known for crime. In 2002, a new government took control of this area and used military and police assistance to take back control. For a period of 2-3 weeks there were huge confrontations between the population living there and the armed forces with people getting killed and many disappearing. People rioted, places got burnt. In the middle of all this, imagine a homeless couple lying on the street oblivious to the chaos around them, locked in a passionate embrace, kissing. Such was the photo that was captured in this moment, thanks to photographer Hector Favio Zamora. Commissioned by the mayor and created by the Veritigo Graffiti Collective, the Invisible Kiss mural is based on this photograph and is now a ten-story-tall love story on the side of a building wall. 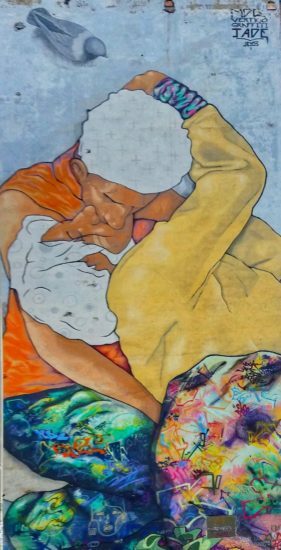 This is a powerful work of art as it stands as a reminder that love can rise up and prevail, even during war, and that everyone deserves love, whether a crack addict or a homeless person. We drove slowly down a street that had some stunning murals when I suddenly noticed the surroundings were a bit raw. Federico explained that this stretch of Bogota used to be a crime-filled, dangerous part of the city to visit. Leaving the street and turning around the corner, we did see some women standing in some doorways, and Federico explained this was the red-light district. But the interesting part about this area is how 20 artists came together, both local as well as international, led by street artist Guache, to paint across several blocks, perhaps sending the message of “transformation”. 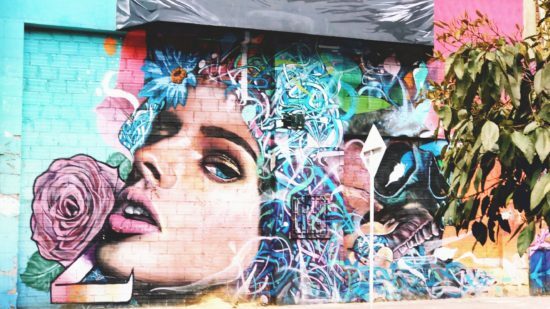 Well-known artists such as Nadin Ospina have lent further credibility to street art by giving graffiti artists permission to recreate some of their paintings on the exterior of several buildings in downtown. Apart from downtown, old town or La Candelaria also has some beautiful street art as well and is a must when you are in Bogota. La Candelaria played to my weakness for colorful doors, windows, and narrow alleys. It is the most historical part of Bogota, like an old town if you will, and has many hostels, restaurants, cafes and bars. This is a great place to sample some colonial architecture and also try Colombia’s national dish, the Bandeja Paisa in Bogota’s oldest restaurant, La Puerta Falsa. La Candelaria is no stranger to murals, and showcases works from local and international artists throughout the area. 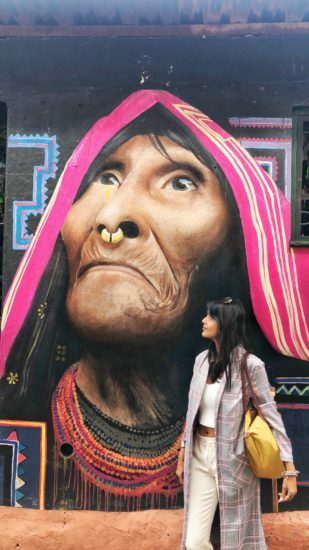 My favorite mural is of a Wayuu indigenous woman by Colombian street artist Carlos Trilleras. It’s eye-catching and real and can be found in a narrow alley Calle del Embudo near the central Plaza del Chorro de Quevedo square. The message here is clear: the Wayuu group that this mural represents is a group that was never completely conquered or suppressed by the Spanish. The mural as well is one that cannot be ignored or suppressed, it’s life-like and larger than life depiction in this alley is unmistakable. If you’re interested in international art in a colonial mansion, don’t miss Botero Museum as well as the pre-Colombian artifacts is the Gold Museum. 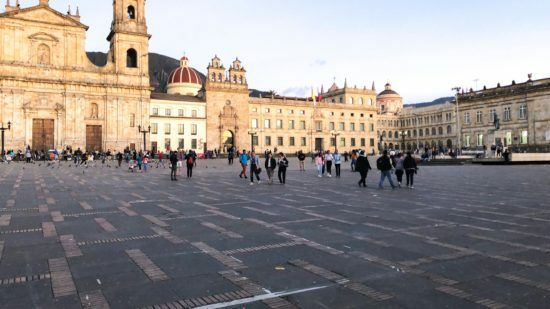 Bolivar Square is a must see, especially in the evenings during sunset, when the sky is varying shades of pink as it stretches toward the Andes. This is the main square, home to neoclassical historical landmarks and is a wonderful place to visit in May when you can witness cultural events such as the Concierto la Esperenza, a free music festival. Public buses and the subway provide easy access and stop close to the square. Beyond street art lies the world of fine art, art galleries and art studios. And there’s nothing more educational than getting to meet an artist in his own studio! The first time I met Camilo Pinto was out on a street. He and his friend were craning their necks up at their latest work of art – a woman that had been painted on a storefront. This was Pinto’s first time dabbling in street art as he is typically an oil and acrylic artist. While he mostly speaks Spanish, Federico helped translate and after introductions we piled into Federico’s car and were soon speeding towards Camilo’s art studio. Walking into his lovely studio, I was immediately struck by the size and subject of his paintings. Camilo predominantly focuses on women as his subject as he feels that women are more diverse than men. To him, Colombia is about diversity and he feels strongly that women reflect that diversity. So most of his paintings depict women and his art work is mostly derived from his imagination. The front part of his studio displays a lot of his larger canvas paintings and his studio out back is his actual workspace. He shows us a painting he’s in the midst of creating and we talk a bit about his preference for Acrylic vs Oil. Wandering back to his living space I observe a beautiful painting of a woman with a horn protruding from the side of her forehead. I contemplated buying this $9000 painting for my living room. The conversation I had with my husband for the next few minutes did not go too well, and alas I ended up compromising towards a smaller painting that was much more in budget range. I’m honored that we now have a Camilo painting hanging in our home. I might have come into Bogota with preconceived notions of a gritty, dark, run-down city. I left however, with a deeper understanding of its transformation and a new appreciation for a dynamic city rich in architecture, food, and art. Give Bogota a chance to show you her gems, you won’t be disappointed. 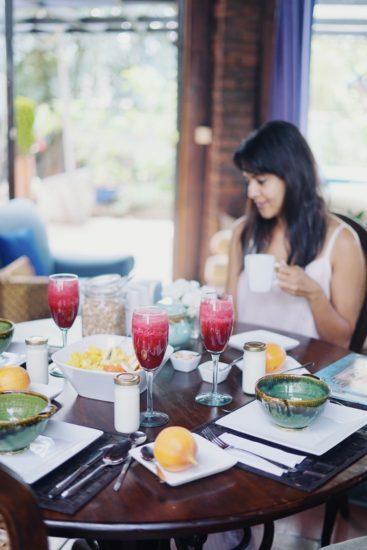 Preethi Chandrasekhar is a freelance travel writer/influencer with a passion for sharing her travel stories to inspire people to explore more of this beautiful world. She’s interested in experiential travel and writes frequently about off the beaten path destinations. Follow her on Instagram and her blog, The Eager Traveler, for more of her travel pics and stories! One Response to "Practical Travel Tips: Bogota, Colombia"
Join a bicycle tour and ride around the city. Fun and informative.